AtoM allows archival institutions to create relationships between archival descriptions and their physical storage locations. 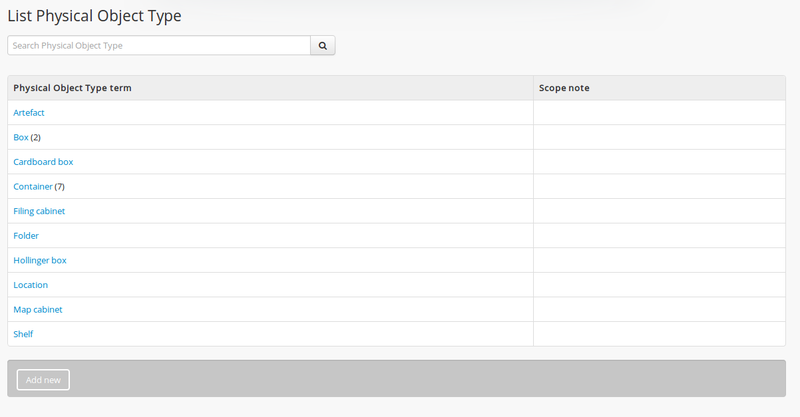 Click on the Manage menu, then on Taxonomies. From the list, click on Physical Object Type. 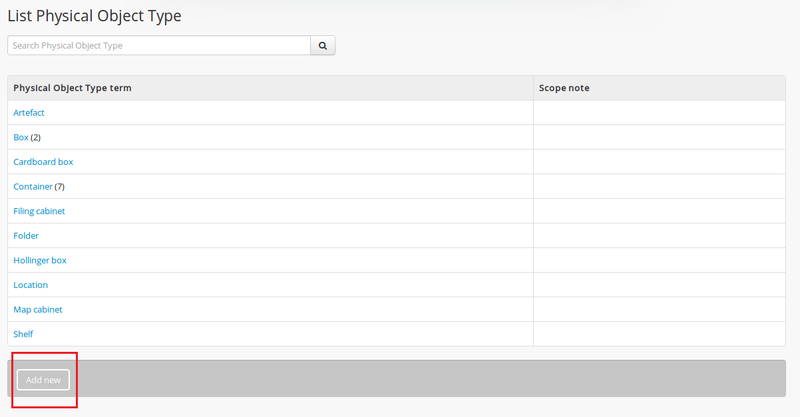 By clicking on an object type, you can view the object type in the taxonomy, displaying hierarchical terms if applicable. For more information on working with terms and taxonomies in AtoM, see: Terms. 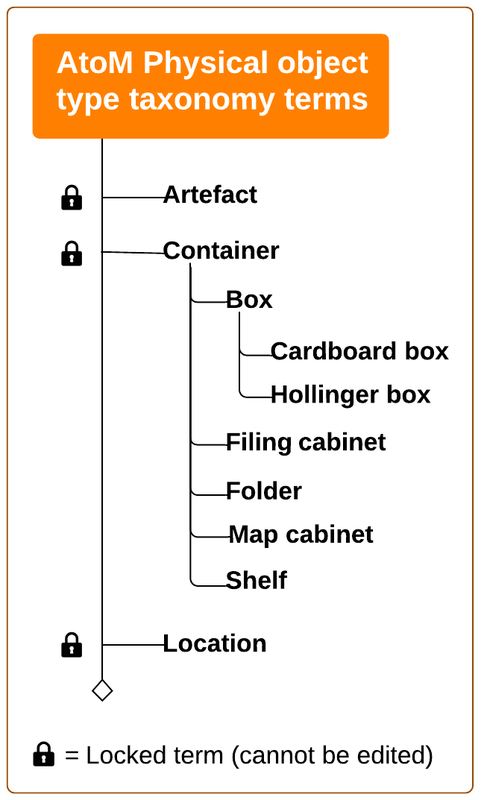 All storage terms except “Artefact”, “Container” and “Location” can be edited or deleted by authenticated users (for more information about locked terms, see Terms). From here, the name of the physical object type can be changed, and internal notes, codes and uses can be added. Click on save to save your changes. Another method of adding a new storage type is to click “Add new” when viewing an existing Physical Object type. This will automatically nest the new term as a child of the existing term. 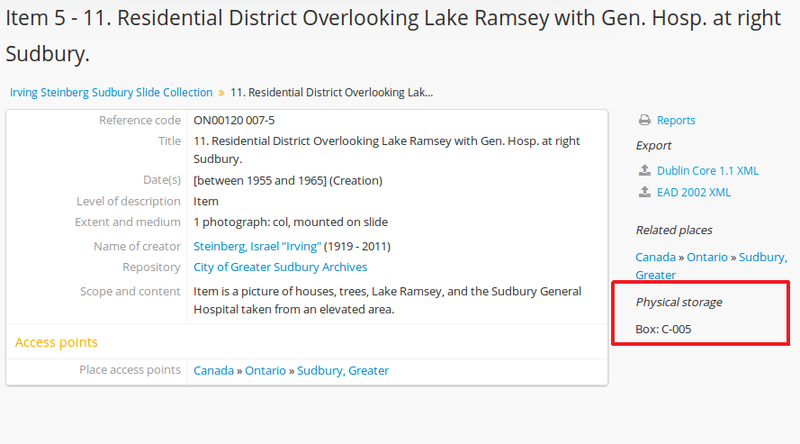 Linking archival descriptions to physical locations is performed from the view page of the related archival description. If a link to a physical storage container or location already exists, it can be edited by clicking the pencil icon, or deleted by clicking the X. This edits the information associated with the Physical storage container and location. 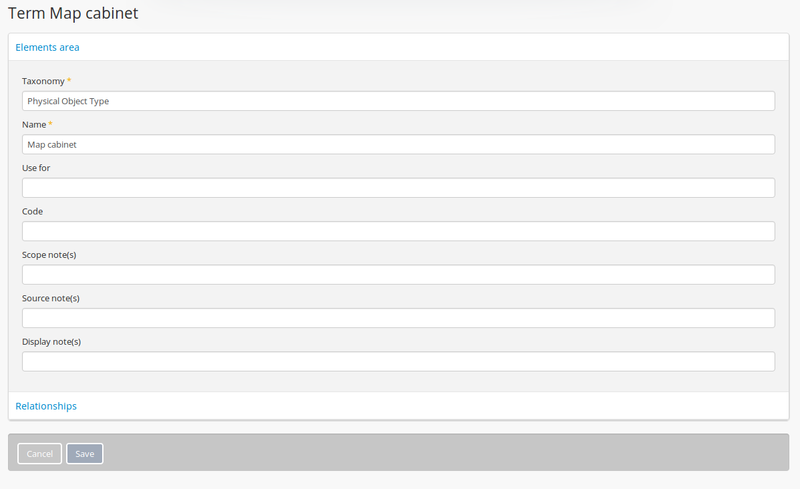 If you change this information the change will apply across all descriptions associated with the container. To create a link with a different storage container, begin to type the container name in the Container field. AtoM will auto-suggest existing containers as you type. To link the archival description with a container that does not yet exist in AtoM, enter a container name, location and type and click save. New containers can also be created from the Browse physical storage area, by clicking Add new (see below). If you click “edit” while viewing a container name, you can edit the information associated with the container, including the name, location and type. To change the resources associated with that container name, you must do so from the archival description for each resource. By clicking the print icon users can produce a report for the storage container which includes the Reference code, Title, Dates, Part of (fonds or collection name) and Conditions governing access. 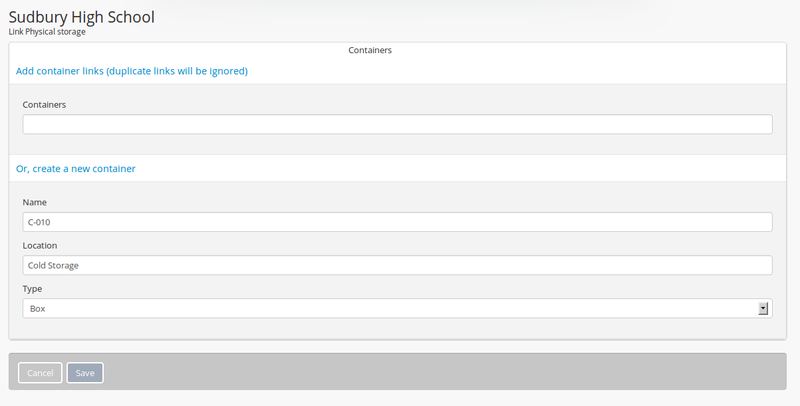 Click “close” to return to the container storage view. 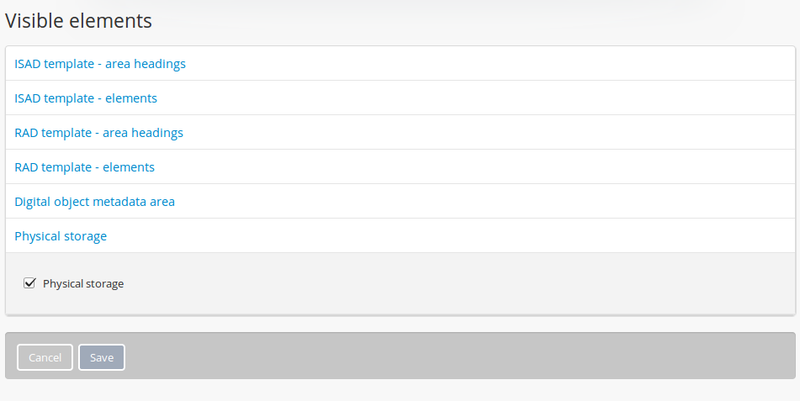 Administrators are able to choose to make physical storage information available to unauthenicated (not logged-in) users or not through the Visible elements section of the Admin menu. To access the visible elements menu, click on the Admin menu in the main menu located in the header bar and select “Visible elements” from the drop-down menu. 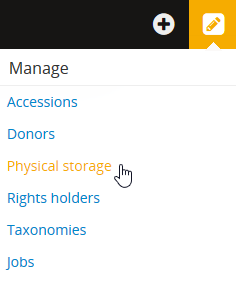 Click on “Physical storage” to show the Physical storage check box. 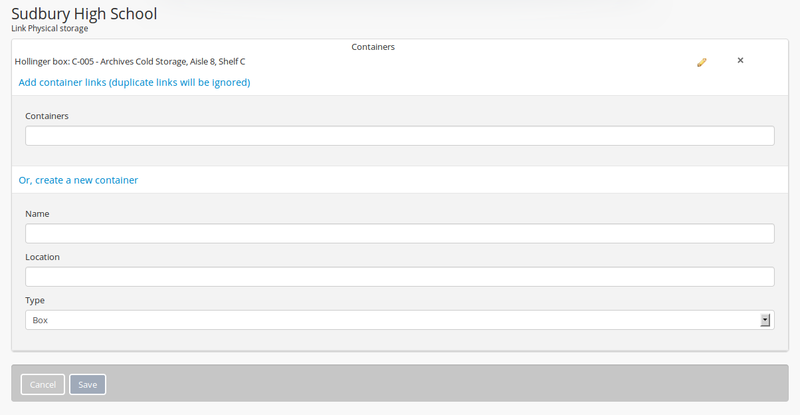 Check the box to allow unauthenicated users to see storage information or uncheck to disallow. Click save. 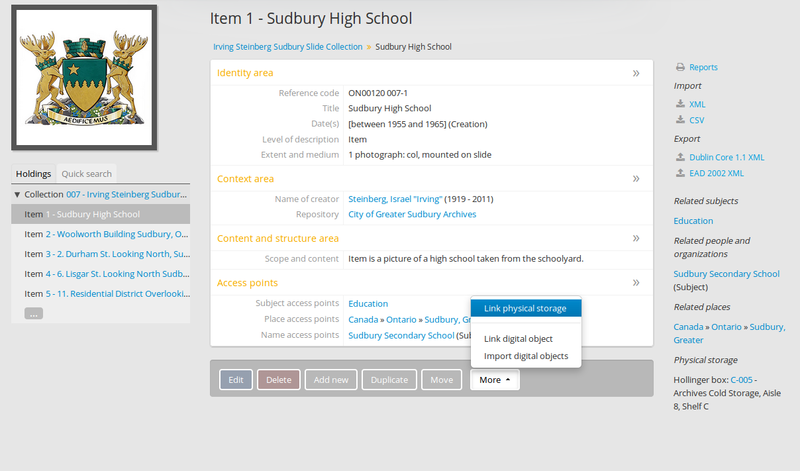 If visible, physical storage information will appear in the right hand column of the screen when viewing an archival description.